Use your magic wand to aim and shoot at magic items! “Hocus Pocus Blaster!” is the 3rd shooting game in the ultra popular series which has been download over 2 million times, “PopCork!” and “PopCork Pirates!”. No registration required, and controls are easy to learn. Download it for free today! “Hocus Pocus Blaster!” is a magical shooting game that takes place in a magic city. Explore dungeons teeming with magic items with your magic wand “Marbas” and start collecting! Playing the game is easy. This game takes advantage of your device’s accelerometer, so you can feel the sensation of shooting down an item. Just tilt your device up, down, left, or right to aim for an item, and touch the screen to fire! Once you learn how far your magic travels and how to steady your aim, you’ll be able to knock down items with ease! There are over 200 types of magic items to collect! Mysterious items such as Fairy Dust, Pyramids, Dragon Fangs, and more await you. You can combine magic items you collect to create magic bullets! Combine up to 5 items at a time, and use rare items to create very powerful magic bullets. Which magic items will create the best magic bullets? You’ll have to try to find out! Keep knocking down magic items and try out different combinations! If you keep progressing through a dungeon, you may encounter a dragon! If a dragon hits you with its fire breathing attack, you will be momentarily stunned, so make sure to time your attacks right! Defeating a dragon will help you to level up as well. The more dungeons you complete and the further you progress into the game, the more rare and extravagant the magic items will be! However! If you fail to complete a dungeon you will lose the magic items you knocked down, so beware! If you can collect all of the magic items, you’re truly a world-class magician! Now go out and explore this magical world! • Accelerometer gives you the sensation of shooting items down! 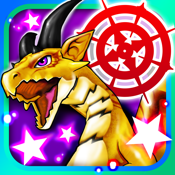 • A magical shooting game! This is an evolved version of the popular “PopCork!” and “PopCork Pirates!” games. • Easy to learn and play! Perfect when you have a little time to kill! • 200 magic items to collect! Try to collect them all!